When a priceless artifact is stolen, museum curator Lana Gomez becomes the prime suspect. How can she hope to adopt her orphaned nephew if she's a person of interest in a crime? Cooperating with Capitol K-9 Unit officer Adam Donovan doesn't get her very far-the handsome cop thinks she's hiding something. But when the real thief returns set on silencing Lana, Adam and his Doberman Pinscher, Ace, become her only defense against a madman that wants nothing more than to see Lana eliminated. 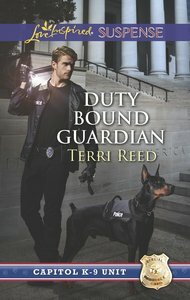 About "Duty Bound Guardian (Capitol K-9 Unit) (Love Inspired Suspense Series)"
Customer Reviews For "Duty Bound Guardian (Capitol K-9 Unit) (Love Inspired Suspense Series)"